We dropped anchor in Meldrum Bay at 7:30 after a day of motorsailing. It was a gorgeous day with mostly clear blue skies overhead and 16-17 knot winds out of the northwest as we headed across Lake Huron from the Michigan shore to Canada’s North Channel. Of course, our heading for the day was north by northwest, so the winds were largely on our nose and did us no favors. At 3 o’clock the wind shifted just enough to the west for us to unfurl the mainsail, then our course had us heading more to north as we cruised through the Mississagi Straits between Manitoulin and Cockburn islands. The winds also kicked up a couple knots as we passed the ghostly white dolomite mining site midway up the straits. Manitoulin Island was to starboard. It is said to be the largest freshwater island in the world. Manitoulin Island is also the home of the largest lake on a freshwater island in the world. As if that’s not enough, it is also home to the largest island on a lake on a freshwater island in the world. I hope you were sitting down for that. My head is still spinning. We rolled up sails before we rounded the northwest corner of Manitoulin Island and motored on into Meldrum Bay. Having anchored just south of the marina, we discussed heading ashore for dinner. 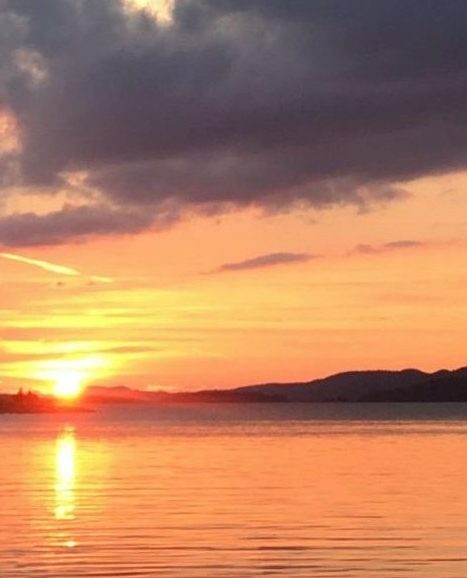 The Meldrum Bay Inn is deservedly renowned for the food—we enjoyed a wonderful meal there last year—and it was a Saturday night. However, we were tired, the hour was late and we were still nursing the financial hemorrhage from our stay in Goderich. Since we already cleared Canadian customs by phone thanks to our Nexus passes, we didn’t have to go ashore. We also planned to leave the next morning for a much anticipated rendezvous with our friends, Jerry and Claire, at Hotham Island—a 40nm trek. So we dined in our cockpit entertained by strains of a singer and his guitar emanating from the inn. 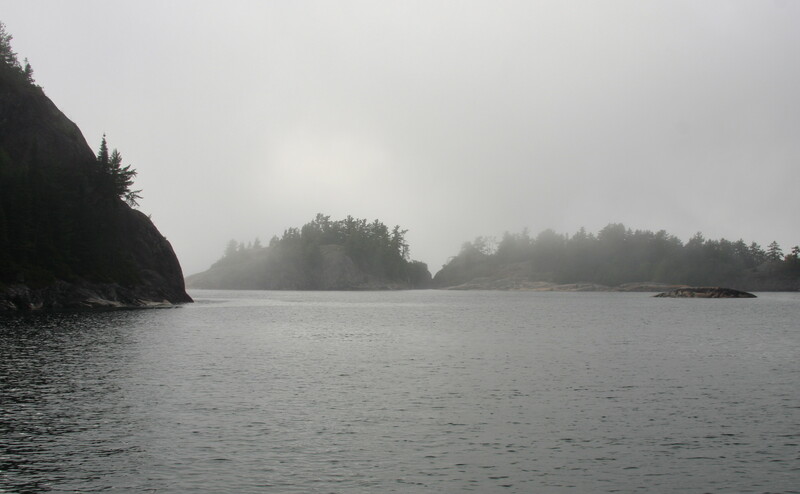 We set off from Meldrum Bay midmorning, Sunday, July 31, under a mostly cloudy sky and in indifferent light winds. Julie had charted us through a shortcut with some skinny water and narrow channels that shaved at least an hour off our cruising time and we pulled into Ray’s Bay on Hotham Island at 4:30. Not surprisingly, the bay was crowded with other cruisers, including our friends Jerry and Clare. 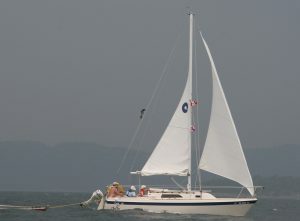 Their sailboat, Magic Carpet, was anchored in their favorite spot off the island in the middle of the harbor. In typical fashion, Jerry immediately deployed in his dinghy to guide us to a nearby anchoring spot. 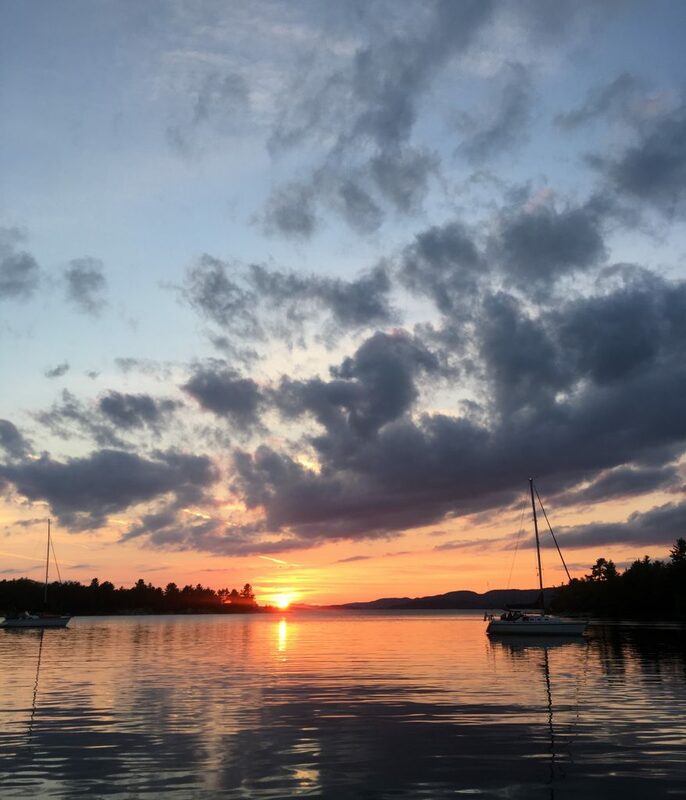 Not long after dropping anchor, Elaine—who lives with her husband, Norm, in a cottage on this idyllic bay–turned up in her kayak to invite us to happy hour ashore. 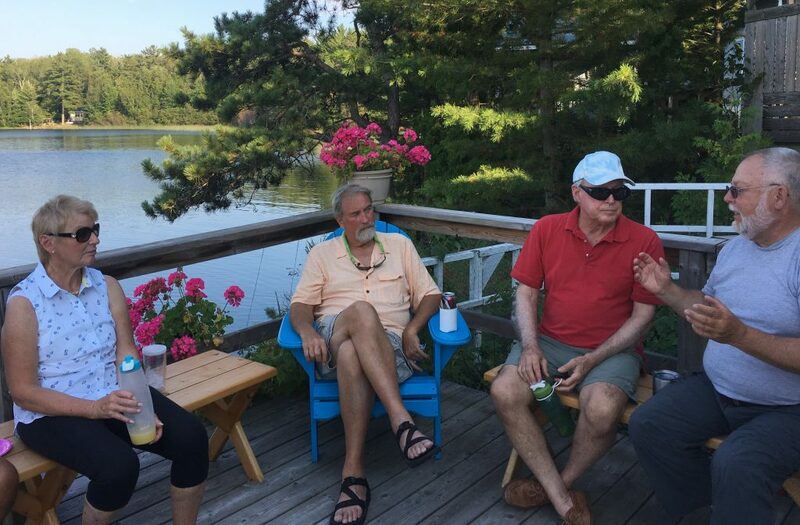 Happy hour at Norm and Elaine’s is a frequent occurrence in this pleasant and well-protected harbor. Like a butterfly flitting from flower to flower, Elaine personally invites each boat in the anchorage to the event. Happy hour there is always “Boat Rules,” i.e., each boat crew brings their own refreshments and a nosh to share. Happy Hour is a well-established tradition in the boating community throughout the world. It does quadruple duty as a respite from the forced isolation of crewmates on a boat, as a way to reconnect with old friends, as a way to make new acquaintances and as a means of exchanging news and information. North Channel happy hours are legendary among boaters. Our planning was heavily influenced by the expected arrival of guests on both boats. Our Minneapolis friends, Mark and Jeanne, were due in Little Current at the end of the week. They planned to be with us for a week or more. Jerry and Clare’s daughter-in-law and two granddaughters were boarding Magic Carpet for a week or so later in August. Over the next couple of days we decided to head to Little Current together, where Magic Carpet would refuel, pump out, provision and move on to Hayward Island—a few miles east of Little Current. We would refuel and pump out, and wait for the arrival of Mark and Jeanne. The next morning we tuned in for our first session this season with the North Channel Cruisers’ Net. The Cruiser’s Net is a radio broadcast on VHF channel 71 from the second floor of the Anchor Inn in downtown Little Current. 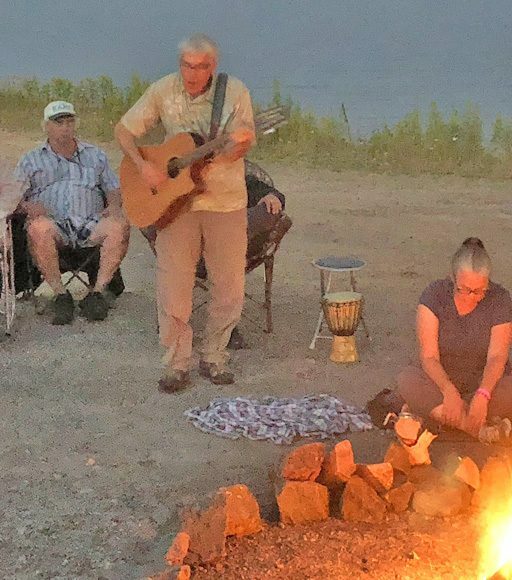 It is hosted by the redoubtable Roy Eaton, a retired educator and longtime sailor, who volunteers his time and talents. Roy was born and raised in the area, so he brings local knowledge and an educator’s instincts as he broadcasts weather and news to cruisers throughout most of the North Channel. 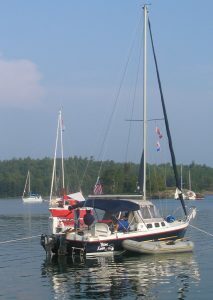 The 110-foot VHF antenna on the roof of the Anchor Inn covers a 50 mile radius from Little Current, from beyond Tobermory to the east to Blind River at the far western reaches of the North Channel. Roy commences the Cruisers Net broadcast promptly at 9 a.m. every day from July 1 to August 31—the heart of North Channel cruising season–and has been doing this since 2004. His typical routine is to invite any listeners to call in with emergency messages, followed by 20 minutes of his interpretation of the news and weather – Roy is a positive guy and likes to keep both news and weather in the same vein whenever possible. If there is no ‘good news’, he sometimes just skips the news altogether! He then invites boaters to call in with their locations and, if departing, their destinations. The idea here is to help boaters locate other boaters and even to facilitate messaging between them. As mentioned earlier, longtime North Channel cruisers know each other and the Cruisers’ Net helps them keep track of one another. It can also be a way to monitor how crowded a destination anchorage might be. If half a dozen boats report in from a small bay with no departure announcements, you might change your plans to go to that bay that day. At the height of the boating season, Roy gets upwards of 100 call-ins a day. 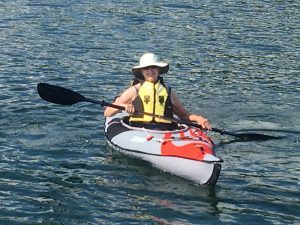 After the Cruisers’ Net broadcast, I pumped up Julie’s inflatable kayak so she could join Elaine and some of the other Ray’s Bay boaters for a tour of nearby bays and waterways. We both bought kayaks in Rhode Island back in May and it was Julie’s first excursion in this kayak. Later, while they were still out exploring, I inflated my new kayak and ventured out for a spin around the bay to get a feel for the new water toy. As I stepped into the kayak for the first time, both ends folded up on me like a clamshell. I managed to stay afloat but it wasn’t pretty nor graceful! Once underway and with more air added to the tubes, I was pleasantly surprised; it was more stable and tracked better than I expected. After two days of fun and frolic with Jerry and Clare, Norm and Elaine, and other boaters in Ray’s Bay, we followed Magic Carpet out of the bay to start out for Little Current. We normally cruise west up the north arm of McBean Channel then either east or west in the south arm of McBean Channel. Out of Ray’s Bay, Jerry turned right and guided us thru the very narrow channel to the east, which would shorten our route by several hours. In previous departures from Ray’s Bay we never attempted this route; charts indicate a depth of just a few feet in a very tight squeeze between rocks. Clare even has her own rock in this channel – named so after she missed seeing the rock due to the sun in her eyes and they parked their boat atop. Jerry assured us we would have plenty of clearance and Clare’s rock was well marked on their charts. We followed—with some trepidation. True to his word, the channel was plenty deep and wide—part of which I suspect was due to the fact that the water level in the North Channel was 3 feet above datum! Not sure I would attempt the channel at normal (datum) level. The shortcut proved to be beautiful and interesting and revealed far more signs of civilization than we’re used to seeing in the North Channel. Portside, the island shoreline segued from rocky primordial forest to reedy wetland to gentle mainland slopes. Cabins and houses and manicured lawns began turning up on the slopes. Once past the forested and rocky eastern shore of Hotham Island, we passed into an area open all the way to Fox Island, which is a half mile to the south. As we moved east, this vista was broken up with islands initially dotted with Canadian “camps”—their word for cottages, cabins and lodges. The frequency of these camps increased on both sides as we cruised east and south. Once into the undivided McBean Channel, we continued southeast. As we approached Sturgeon Cove, our destination on the northwest side of Great LaCloche Island, I began to get a sense of déjà vu. Adjusting the e-chart on my iPad, I realized that we had been in this same spot 13 years ago in Blue Loon, our 4,000 lb., 22-foot Rhodes trailable sailboat. We had been racing down the north arm of McBean Channel from Eagle Island, some 15 miles west. Chased by an increasingly nasty-looking storm front, we were less than a mile from our destination—and refuge from that storm: Sturgeon Cove. We were the last of a fleet of 20 or so trailer sailors still out in the open water. Most of the boats had already been guided through the tricky entrance into Sturgeon Cove by lookouts on either side. Each lookout was equipped with a handheld VHF radio to talk skippers thru the tricky entrance to the cove. A few boats—laggards, like us—had already ducked into the more open and accessable Bell Cove, an anchorage just west of Sturgeon Cove. We had already hauled in all sails and battened down everything we could as the storm bore down on us. The Loon’s retractable centerboard was down for additional stability. Directly downwind a few hundred yards was the buoy marking Luard Rock, a submerged pile of rocks we did not want to get close to. I was at the helm and Julie was hunkered down on the portside cockpit seat next to the closed companionway. We were both swaddled in rain gear and strapped into our life jackets. I steered gingerly to starboard to get a better angle into Sturgeon Cove amid increasingly roiling seas. BAM! Straight-line winds knocked us over to port. From my perch on the starboard seat at the rear of the cockpit I saw the mast slap the tops of waves and saw water gush over the port rail and into the cabin as Julie scrambled to starboard. I also saw our portside-mounted 10-horse Yamaha outboard go underwater. I had one hand on the tiller; one hand on the boat; Julie was hanging onto the boat with both hands. The Loon popped right back up and started to round up into the wind. I grabbed the tiller with both hands. Struggling to keep the tiller straight, I noticed the wind had flipped the dinghy we were towing 15 feet behind us. Upside down, it effectively became a sea drogue—a chute deployed in the water to work as an anchor in open seas. My efforts to keep the boat tracking straight and avoid getting crosswise to the wind were for naught: the dinghy-turned-drogue pivoted the boat clockwise. BAM! We got slammed and knocked over again. As quickly as it hit, the straightline wind passed. Weather reports later confirmed we were hit by 55 mph winds. We were still in gusty, 20-30 mph winds and increasingly churning seas, but I was able to get the Loon under control and into the wind. Despite being dunked in lake water twice in short order, the Yamaha had not missed a beat and was still purring along. That made me a fan of Yamaha outboards for life. Julie radioed the guides at Sturgeon Cove to let them know we were ok and under control. They advised us to make for Bell Cove in light of the wind and crashing waves at the entrance to Sturgeon Cove. A quick attempt to flip the dinghy as it came by failed, so we made for Bell Cove dragging the upside-down dinghy and keeping a weather eye for further big gusts. In Bell Cove we dropped our anchor and tied to shore near the other trailer sailors already there. Ongoing high winds kept us there for two days. Other than having to dry out some cushions and carpeting below decks, we sustained no damage and lost just one thing: a paddle from the dinghy. As we navigated our Gozzard 41 through the tricky entrance into Sturgeon Cove, I was feeling grateful for the calm cloudy day. I was also feeling grateful for the 23,500 lb vessel I was steering, with its 8600 lb keel. Next PostCatching Up – Fast Forward Through The Erie Canal! 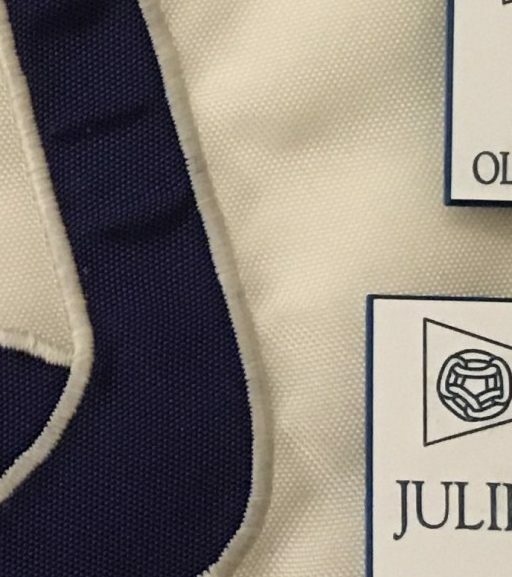 It’s Official – We’re Port Captains! Another wonderful account of your sailing adventures. Thank you very much for your promotion of the Cruisers’ Net. It was special to have you drop in and share your adventures with the listeners. Best wishes for years of continued memorable Cruising adventures and enriching times. And thank you for sharing those times with your faithful readers. Thank you, Roy, for your service and dedication. Your presence and efforts tower well above the VHF antenna on the roof of the Anchor Inn; you are a boon to visitors and residents, alike. Wow! Reliving that time. From your viewpoint. Glad we all survived. The next morning our alcohol stove in the swirling winds went off. The only fire we fought in our life. Tried to put out fire with rug. In the bay. Sprayed a fire extinguisher. Still tracking and cleaning up Maija Lisa. Turned out water was the correct answer. Community was created in hazards. Had forgotten about your alcohol stove fire. Lots of stories associated w/that storm such as the rudders of two or three other trailer sailors bent or damaged. You may recall the sailor across from us at the Sportsman in Kincardine who was out on Georgian Bay in that storm, got tossed down the companionway, broke ribs and a leg, was concussed or passed out and was otherwise incapacitated. His girlfriend was unable to summon help because when she finally figured out how to use the VHF to send out a distress, she had no idea how to relay their location. Big takeaway for us was to make sure guests on board know where to find emergency equipment and supplies and know how to use them, as well as communications and location systems.